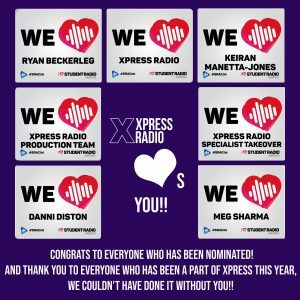 Disbelief, excitement and nerves are just three of the emotions I’m feeling after Xpress Radio and it’s members have received 7 nominations in the I Love Student Radio Awards. As far as I’m aware, every award we entered was successful in being nominated, and as much as I would love to walk away with lots of wins, the nominations are recognition enough for the hard work that has gone into the past however many months of madness. Before I go onto the nominations, I want to recognise the hard work that has gone into the past years that has allowed us to get to this stage. 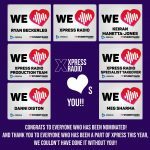 The past few years have been filled with complications for Xpress and it’s management committee, and I am grateful for the perseverance they showed in the face of adversity. It would have been easy to give up and leave the station in bits, and I can’t even begin to imagine what it would have been like for my previous big bosses. So again, thank you for your hard work, the nominations are as much yours as they are ours! It may seem silly to be getting so excited after some nominations, but these really demonstrate and recognise our hard work as a station. I’d rather celebrate this now, because it doesn’t really matter if we win or not! Congratulations to Ryan Beckerleg, Keiran Manetta Jones, and Danni Diston for their individual nominations for commitment or contribution to Student Radio. These are all so well deserved. Well done also to our Production Team who we set up brand new this year and have been absolutely invaluable to us. We hope this nomination shows our gratitude! We also received a nomination for our Outreach during the Specialist Takeover, which was such a monumental event for us, and we loved working with Cardiff Foodbank during this. Finally, we were nominated for ‘Most Improved Radio Station’ which means the world as everyone has worked so hard this year. Improvements can be seen and felt everywhere and the committee have put their hearts and souls into this little radio station, so this one is really for everyone. I’m definitely looking forward to The #ILSR award on the 17th of April now, and whether we take home any awards or not we’ll be having a cracking time!